I love the background!! Gives movement to your racing hare! Just beautiful! 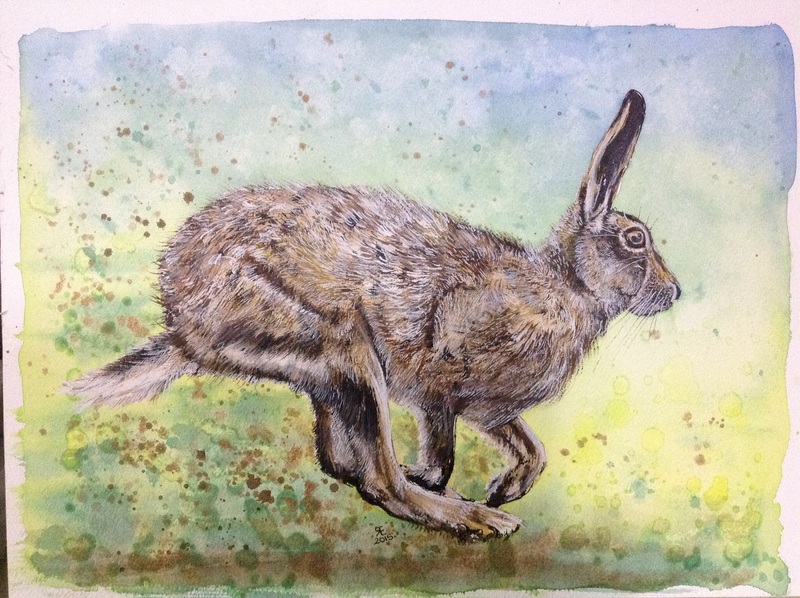 Thank you…I have a plan for my next running hare, to create much more movement, if it works it will of course be posted, if you don’t see it……a flop! Thank you, I was debating with myself that it could have looked better without the background, but it does give it movement. I love it! Wouldn’t change a thing. Love the splatter too. You are wonderful with furry things! Thank you Laura, I am usually safe with hares, a bit of familiarity gives me satisfaction. Beautifully done! I like the background too – it makes the picture so much more dynamic. Great work! Thank you, it’s good to get feedback, especially when you are debating with oneself about paint you have or have not put down.